So, what you're supposed to do is close yourself in a bathroom, turn off the lights, and look into the mirror. Then you are supposed to chant, "Bloody Mary, Bloody Mary, Bloody Mary" and she could will appear. She's got a pale face, dark hair, and she might just have a hunger for your soul. Hopefully, your daughter has not done the ritual and since she didn't get sucked in the mirror to live with the legendary Mary for the rest of eternity, then most likely she hasn't done it, at least correctly. Bloody Mary is going to truly come to life when your child puts on the spooky costume. The tradition of her character has many different back stories, some of them modern urban legends that include someone named Mary coming to various tragic endings and wanting revenge. Most versions are based on a Mary who was tried for witchcraft at Salem. The most popular variation is based on Queen Mary, who was known for her vicious British reign. No matter how the legend came about, we all know that this ritual is one of the most scarring events of slumber parties everywhere, except for that nasty hand in warm water trick. 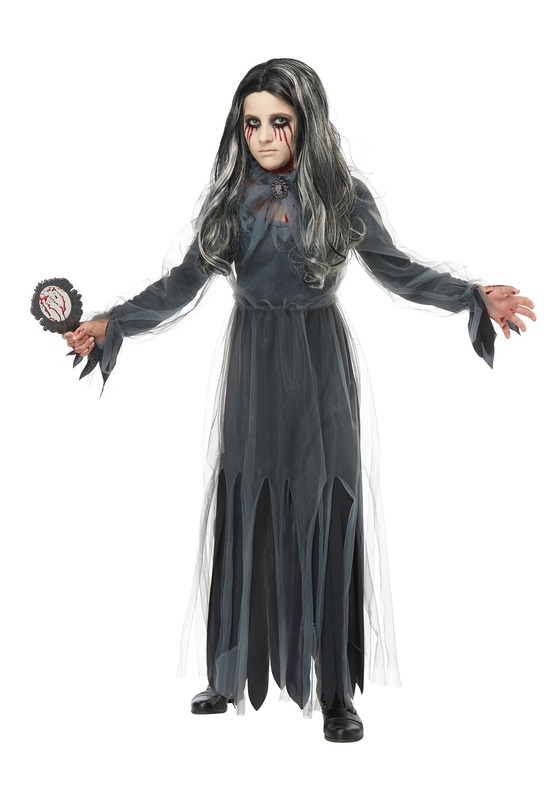 In this gray and black tattered gown, your daughter will appear ready to steal the souls of any of her friends who wake her up from her slumber. Paint her face to give her a truly horrifying guise. This costume sure gives her pals a reason to listen to her when she says, "That's my name, don't wear it out."